"Kenya is now well positioned to set the pace on the African continent as a country that is at the forefront of recognizing the rights of people with disabilities, including little people." On the evening of October 5, 2013, I received an e-mail that changed my life. 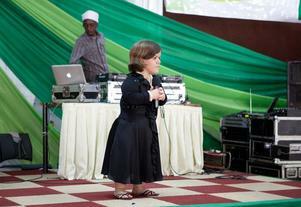 I was invited to be a keynote speaker at the official launch of the Association of People with Dwarfism in Kenya. It was an opportunity that I couldn’t pass up. The leaders, who later became close friends, planned for me to fly to Nairobi on November 26th and return home on December 6th. This meant that I would miss Thanksgiving in the United States. Even though Thanksgiving is a wonderful time to give thanks, eat good food, while spending time with close family and friends, I knew that I had an opportunity of a lifetime waiting for me. After finding out that the trip was ahead of me, I had to start preparing. I got the recommended travel shots and malaria pills for the trip. I was instructed to take one pill a day, starting the day before arriving in Kenya. I thought that I would be more nervous than I was. I think the thought that I would officially become an International Motivational Speaker after the trip, put me at ease. People always ask how far I’m willing to go to speak and I’ve always responded by saying that I’ll go wherever there’s a need. I knew there was definitely a need in Kenya. I always tell people to ask questions and not make assumptions. Some people assume the worst before agreeing to an opportunity like this. I had no clue what to expect upon arrival, however I had faith and trusted that I was in good hands. Throughout my entire trip, there was never a moment when I didn’t feel safe. Upon arrival at the Nairobi airport, along with the Ruh family, disability strategists who I traveled with, we were escorted out of the airport, to the VIP Lounge, by Nairobi Senator Mike Sonko’s security guards. The local television stations interviewed us. We were then brought to our hotel, which also felt very safe. 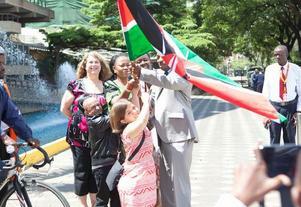 By the next morning, a majority of the people in Nairobi had seen me on television. When I was younger, I always made my parents replay home videos because I wanted to see “Becky on TV” and it finally came to life in an international setting. Every day that lead to the December 3rd launch event was filled with media interviews. Through newspaper, radio, and television interviews, we were determined to make the entire country of Kenya aware of the launch event. Of course the launch event served a higher purpose than just that day. It was finally a chance for the voices of the little people of Kenya to be heard. They were able to address their goals, from preventing parents from hiding their dwarf children, accommodations in educational settings, and job opportunities. There are no knowledgeable or specialized medical doctors for little people in Kenya. None of the little people have any form of medical history pertaining to their conditions. This breaks my heart. I was fortunate to grow up in a family where my parents found the very best care for me. Dr. Steven E. Kopits was my childhood orthopedic specialist.